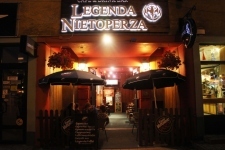 We are in Zakopane for over twenty years. Café won the hearts guests not only delicious coffee, a wide range of teas and homemade cakes sypanych, but above all, a breathtaking panorama of the city and the Tatras extending from the terrace. Will surprise you with a unique atmosphere and unique atmosphere of the place. Witkiewicz times, Malczewski and skiing trips Oppenhaima. STRH is a newly established lookout cafe and gallery, which is located on the 3rd floor (the attic) in a recently built apartment building "krupowki 4A." Welcome!